Do you monitor online conversations? Whether you want to observe quietly, learn about your customers and what they’re looking for, respond to critics or simply engage in conversation, you need to know what people are saying. In this article I’ll share six tools to use to monitor mentions on blogs and social media. 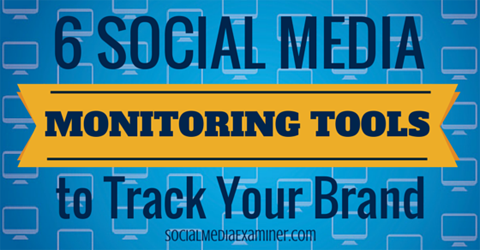 Discover 6 social media monitoring tools to track your mentions. Type in the name and click Search to see the links to your mentions. Sort by timeframe or source. Also, find your brand’s strength (how often it’s being discussed), the passion of the posting (how likely someone will repeat the mention), the sentiment (positive to negative) and the reach (measure of influence). 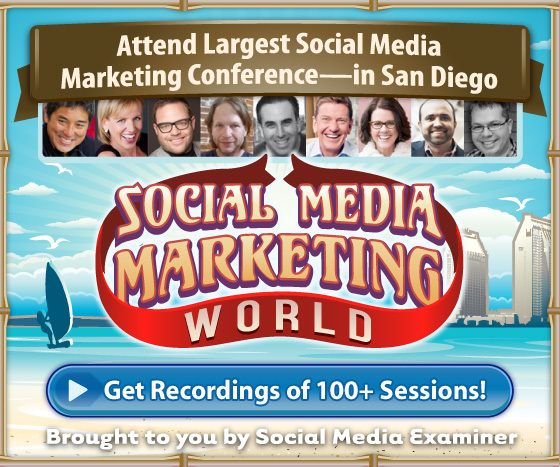 Learn the top keywords, users, hashtags and sources as well. Social Mention is an excellent way to search for people who are talking about your brand. 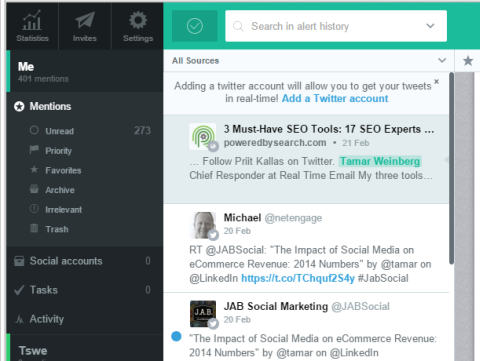 Plus, get an RSS feed of your mentions to stay in the loop. 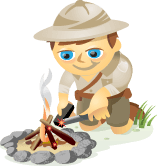 Social Mention is a free online service. 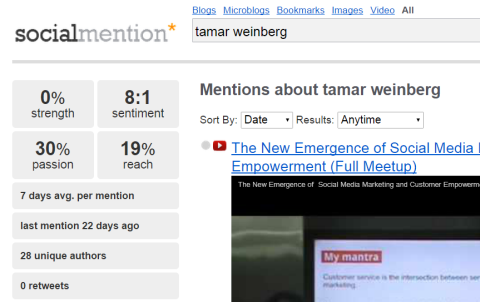 Mention is a way to visualize your online presence, separating the signals you want from the rest of the noise online. The platform allows you to monitor millions of sources in real time and in 42 languages, so you can react and interact. Mention allows you to monitor and respond in real time. Do an online search or elect to receive a daily email of the aggregate of mentions from the previous day. Plus, if you work with a group or large company, export stats to PDF or CSV, so you can share data with your team. 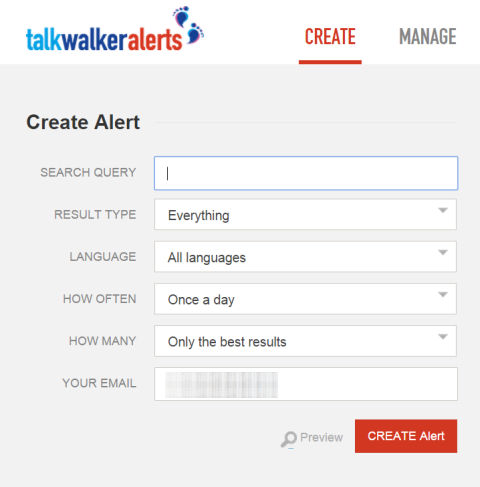 Use Talkwalker Alerts to set up a search query for your keyword or phrase. Narrow the returned data by result type, language, frequency and quantity. Set up keyword or phrase searches through Talkwalker Alerts. Talkwalker gives you brand mentions over time, as well as the sources where these mentions occur. Learn about the performance of the brand mention, the engagement levels, influencers talking about your brand (this includes websites, as well as social media), sentiment analysis, general themes featured in a tag cloud and demographic data (location, language and gender breakdowns). There’s even a world map tracking where conversations originate. 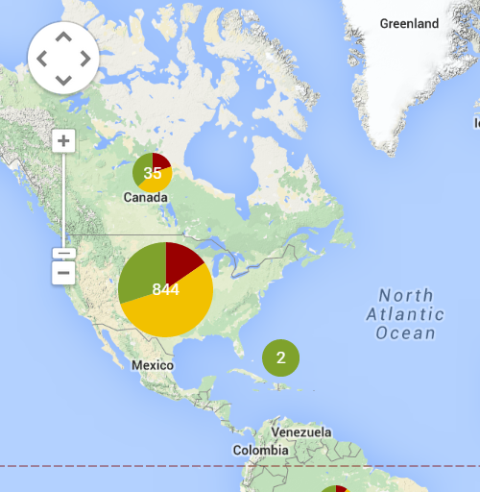 Pie charts hover over every location to indicate the sentiment in each country. Talkwalker Alerts narrow keyword performance by many factors, including geographic location. While Talkwalker Alerts is another free service to use as a replacement for Google Alerts, I don’t find it as comprehensive or thorough as Mention. For example, on one of my searches, Talkwalker found about 50% of the references that Mention located. However, I use them in tandem to ensure I have decent coverage. Sort by links, tweets, photos, videos or influencers, or include everything. Plus, drill down to how recently results were discovered. This is especially helpful if you have a large volume of content to wade through. 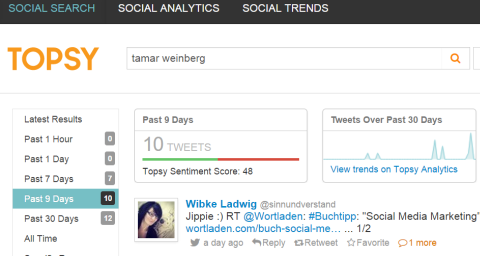 Topsy’s social search can be sorted by timeframe, and includes a sentiment score in addition to analytics. Perhaps the easiest and most common brand-conversation monitor is Hootsuite. It helps you keep on top of chatter in real time on social media platforms such as Facebook, Twitter and LinkedIn. First, add a stream, and then select the keyword. Now, select the account under which you’re monitoring the brand. Next, type in the keyword or phrase. Add it, and then add the stream. 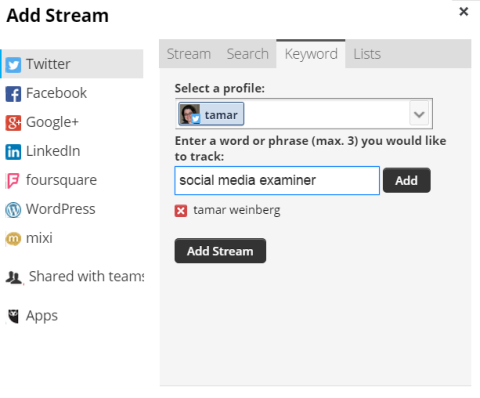 Use Hootsuite to monitor social conversations by adding a keyword or phrase in a stream. Using this tool, you can jump right into conversation with people on Pinterest who shared your pins and develop relationships with them. 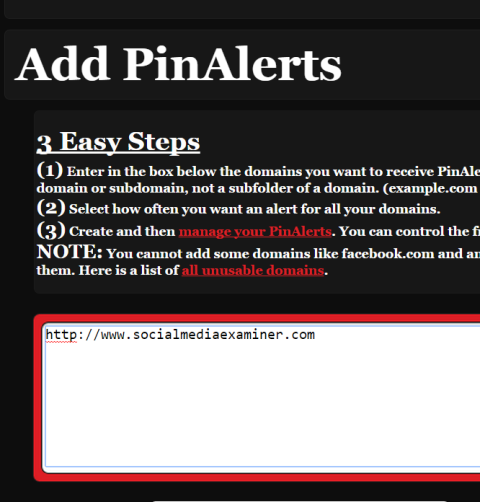 PinAlerts helps you monitor who pins from your site. PinAlerts gives you another angle from which to monitor the mentions of your brand’s URL. It’s helpful to monitor your brand online, so you can engage when appropriate and respond when necessary. These tools are time-savers that make monitoring easy. Many of these tools are notification systems that allow you to act when you see alerts. And most, if not all, of these platforms have a real-time search component. If you’re monitoring a brand of any size, a combination of these tools will help you stay on top of the conversations and become part of your social community. What do you think? How do you monitor your brand on social media? What are your favorite social media monitoring tools? Please share your thoughts and recommendations in the comments. 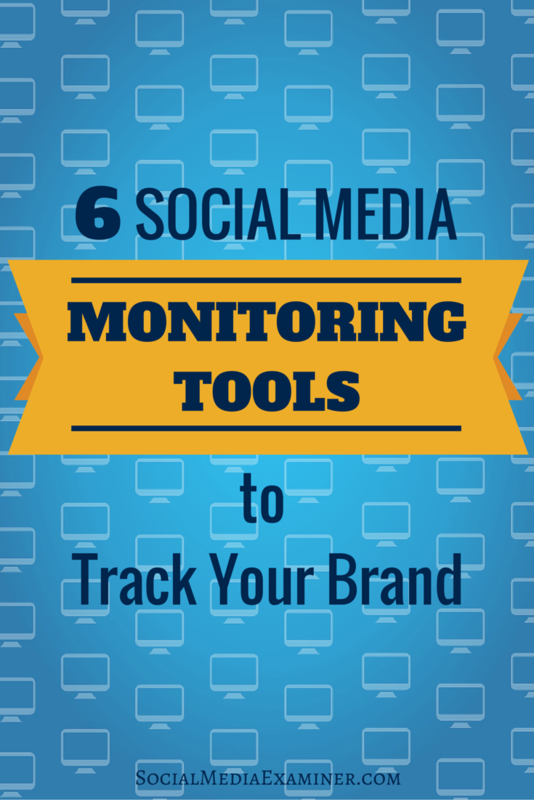 6 monitoring tools for tracking your brand on social media.